Men and women on the earth multiplied quickly and with evil intent. Fallen angels (demons) had their way with some of the women on earth and conceived children called Nephilim. The Nephilim were big in stature and were widely feared. God saw the corruption on the earth increasing and had to put an end to it. God saw that Noah was the only man on earth who was faithful to Him. God told Noah that He was going to destroy all mankind because they were evil and caused nothing but violence. 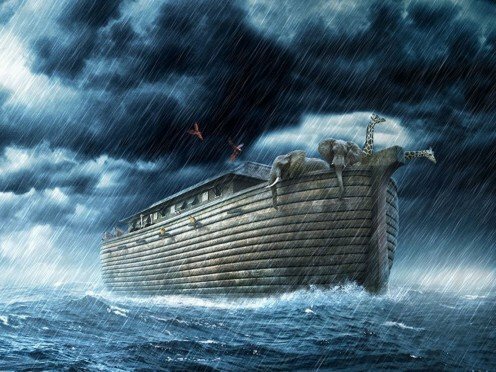 God told Noah to build an ark because God was going to bring a great flood of water that would fill the whole earth to destroy everything on earth. God told Noah that when the flood came he was to put his wife and his sons and their wives on the ark with him. God also wanted Noah to put onto the ark two of each kind, male and female, of animals along with creeping things. God also wanted Noah to store up food for the duration of their stay on the ark. Noah did all that God told him to do. 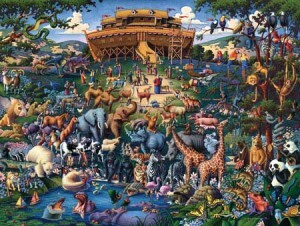 God told Noah that the time had come to bring all the designated animals and creeping things onto the ark. So Noah gathered all the animals and creeping things that God told him to gather and he put them onto the ark. Noah brought his family into the ark and waited for the flood to come. God brought forth the flood and the waters came from above and from below to fill all the earth. The flood continued to fill the earth for forty days killing all that was alive. The waters stayed on earth for 150 days. God stopped the flow of water from coming out of the earth and from above. God made a wind that blew all over the earth to cause the water to recede. After the water receded some, the ark was able to rest on the top of Mount Ararat. After resting on Mount Ararat for forty days, Noah sent out a raven from the ark to see if there was any other land – the raven never came back. Then, Noah sent a dove to search for land, but the dove did not find any land and came back. Noah waited a week and then let out the dove again. The dove came back with an olive branch. Noah knew that there was land now and let the dove go out again; the dove never came back. God told Noah to open up the ark and let everyone and everything out of it. 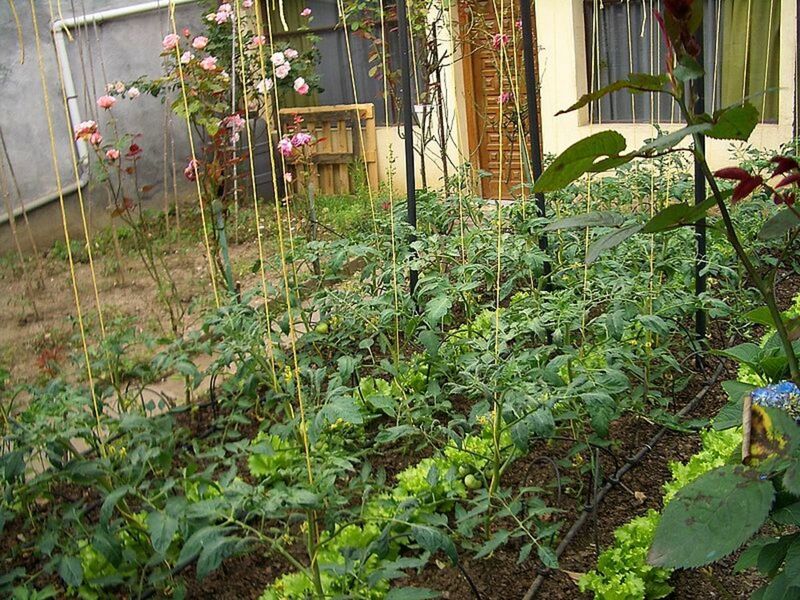 God told all the living creatures to go spread out on the earth, be fruitful, and multiply. Noah made an altar, and burnt some clean animals for an offering to God. God told Noah that He will never curse the ground again due to man’s evil ways. God also told Noah that He will never again strike down every living creature like He did and He will let the four seasons remain the same. God blessed Noah and his sons by telling them to be fruitful and multiply and fill the earth. God said that they would have dominion over everything on earth. God warned them not to eat flesh with blood in it. God also warned them against killing each other; if a man kills/murders another man, that man will be killed too. God told Noah and his sons that they will have dominion over all the earth. God also told them that He will never flood the whole earth again. As a sign of the covenant with them, God set forth a rainbow from the clouds as a remembrance of the covenant. 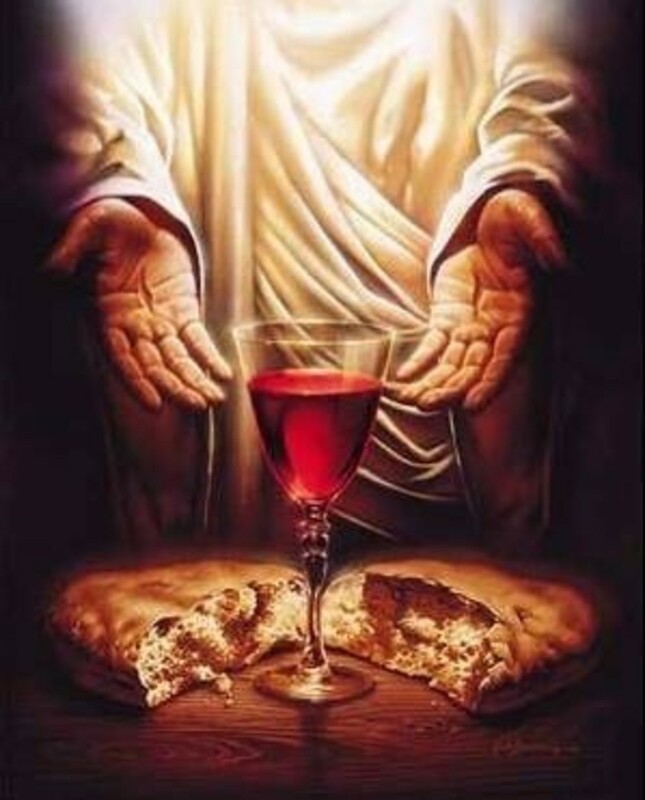 Noah planted a vineyard and made wine from the grapes. Noah got drunk, got naked, and then passed out. Ham found his father passed out naked and told his two other brothers what he saw. Shem and Japheth took a blanket and backed into Noah’s tent in order not to see their father’s nakedness and covered Noah. Noah woke up later and found out that Ham did not keep what he saw to himself and did not cover his father. Noah cursed Ham for not being discrete by cursing Ham’s son (Canaan). Noah said that Canaan was to be a servant to Ham’s brothers. Noah lived 350 years after the flood. When Noah died, he was 950 years old. Nimrod was the first mighty man on earth. Nimrod was a great hunter. In the land of Shinar, Nimrod built the kingdoms of Babel, Erech, Accad, and Calneh. In the land of Assyria, Nimrod built Nineveh, Rehoboth-Ir, Calah, and Resen. All the people spoke one language. The people migrated eastward to the land of Shinar, and settled there. The people built a city in Shinar made out of brick and mortar. The people also began building a tower that would reach the Heavens. God saw what was taking place in the land of Shinar (present day Iraq) and had to put an end to the building of the tower. God knew that if the people continued to stay together, they would be able to build greater things than the tower. So, God confused their language by giving each person his own language. God also dispersed all the people in the city in all directions away from the city. 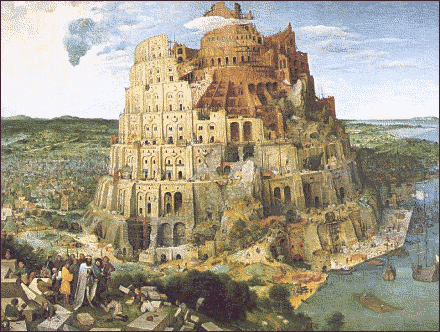 The city was called Babel, because God confused the people’s language. What is your favorite event of this article? This hub article takes beginners through the first five chapters of the Book of Genesis from the Bible. This hub focuses on the creation of the universe, Adam & Eve, and Cain & Abel. This hub article takes beginners through Chapters 12-17 of the Book of Genesis from the Bible. 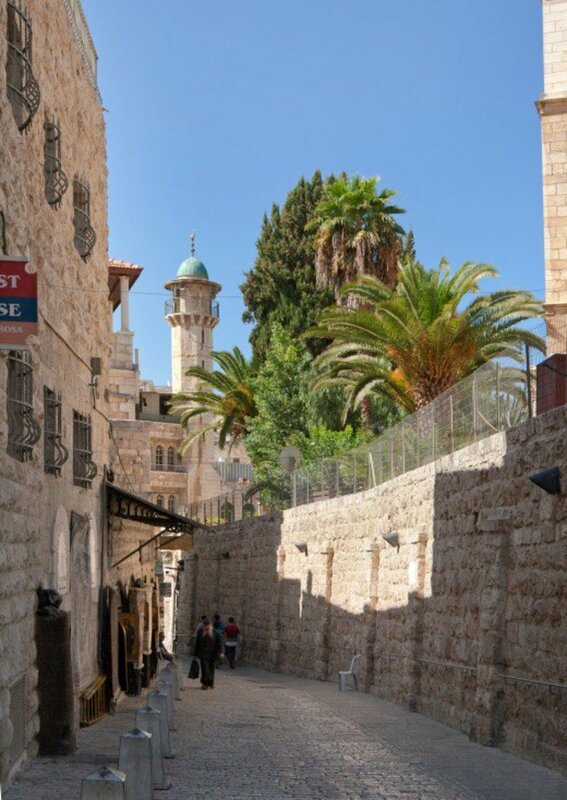 This hub focuses on Abraham and his journeys. Buy The Book of Genesis for Beginners by James Adams (eBook) online at Lulu. Visit the Lulu Marketplace for product details, ratings, and reviews. When GOD "chose me" to preach HIS WORD; HE gave me "wisdom and understanding" of what HE SAID in WORD and there are a lot of things I've "noticed" that hasn't been "taught" since then! Things that go against every denomination's belief! Don't get upset when I show you what HE'S "revealed" to me concerning your faith rather "STUDY" (II Timothy 2:15) to "See if these things are so" (Acts 17:11)! I admire your "honesty" and "open-mindedness" when shown something you'd never observed. Most men would have said "I knew that" knowing all the time they'd never seen it before! God Bless and Be Prepared for "New Revelation" for GOD wants us to "Grow" (II Corinthians 3:18) and not remain "complacent!" There is a lot that the Sunday School teachers aren't aware of because they were not taught right......That is a good observation though...I did not notice that before. Did you notice Chapter 7 verse 2 of Genesis contradicts what the majority of us were taught in Sunday School? "Of every CLEAN beast thou shalt take to thee by SEVENS, the male and his female: and of the beasts that are NOT CLEAN by TWO, the male and his female?" I'm sure GOD took into consideration that the CLEAN beasts were to be used as "sacrifices" under the Old Covenant and therefore commanded Noah to take those in by SEVENS! Food for thought! I'm ALWAYS seeking TRUTH in HIS WORD!